Just how do plants protect themselves from herbivores and illnesses? 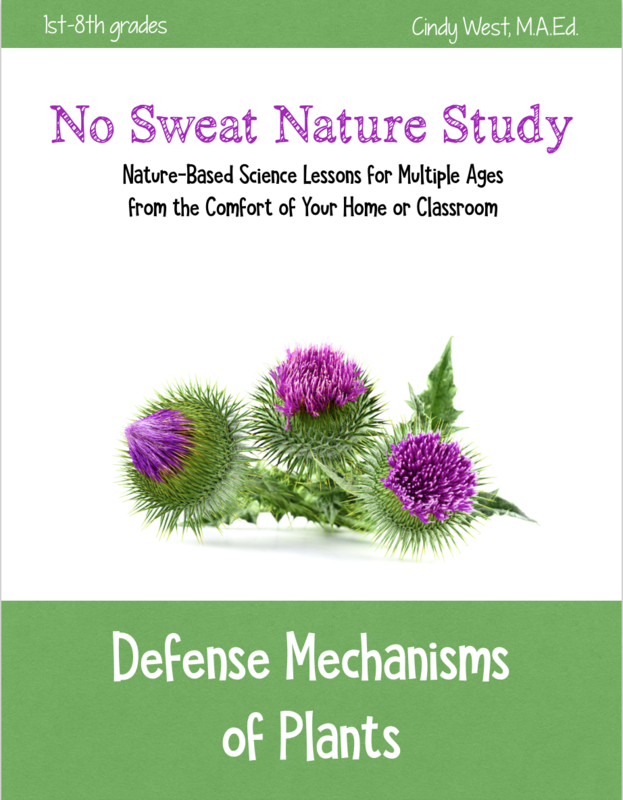 You’ll be amazed at how many defense mechanisms plants have! From thorns and poisons to stinky smells and self-destruction, plants are prepared for battle. 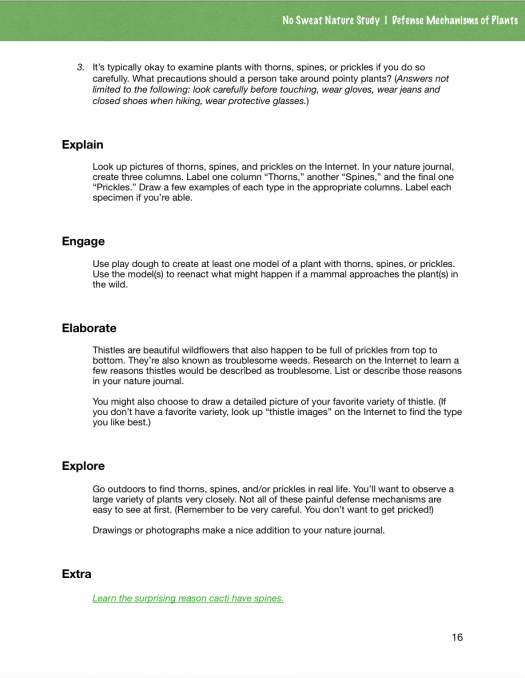 Have you ever wished for a nature study that simply didn’t require any outdoor time? No packing of bags full of nature journals and sunblock. No half-days spent driving to and from the nature trails. No whining about the temperature that’s either too hot or too cold. Well, it’s here. 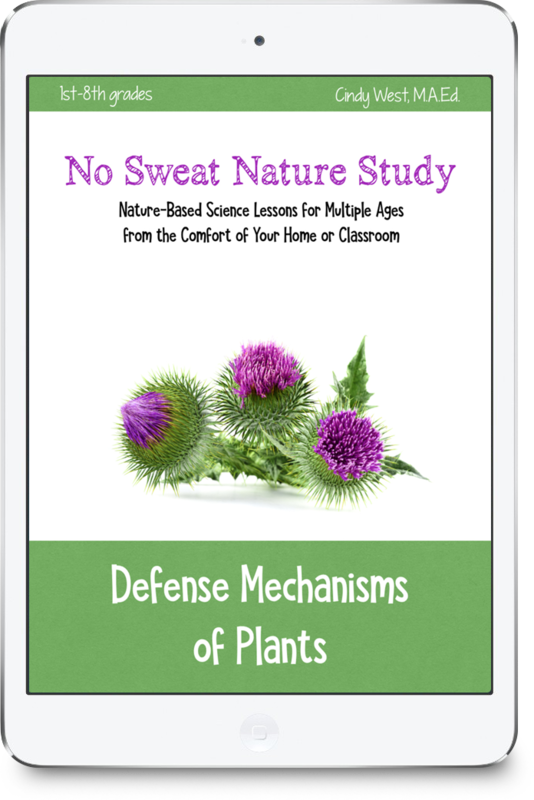 Defense Mechanisms of Plants is the first in a new science series called No Sweat Nature Study and I’m SO excited about it! 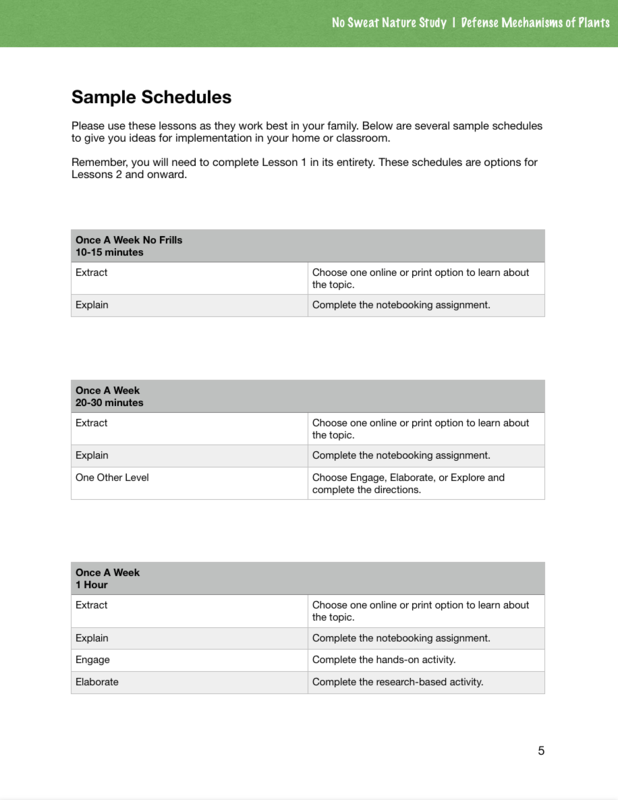 The No Sweat Nature Study series allows you to teach nature-based lessons from the comfort of your home or classroom using an amazing variety of fresh resources that will make a deep scientific impact on your students. Through the use of kid-friendly, hand-selected videos, websites, online images, and books, you can teach nature study topics to multiple ages in short bursts of time. Wait. 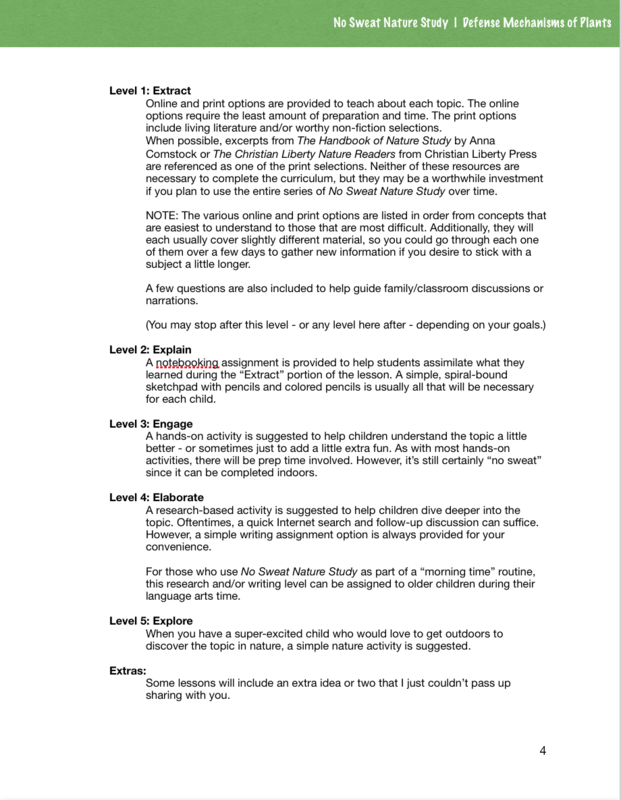 Some of you are die-hard fans of “real” nature study – the outdoor kind – and you’re wondering how this curriculum could be legit, aren’t you? Trust me when I say I am all for getting outdoors for real-life nature study. In fact, nature walks have been a weekly habit around our house for years and years now – and they’ve made a huge difference in our homeschool. Some people just don’t like getting outside, though. 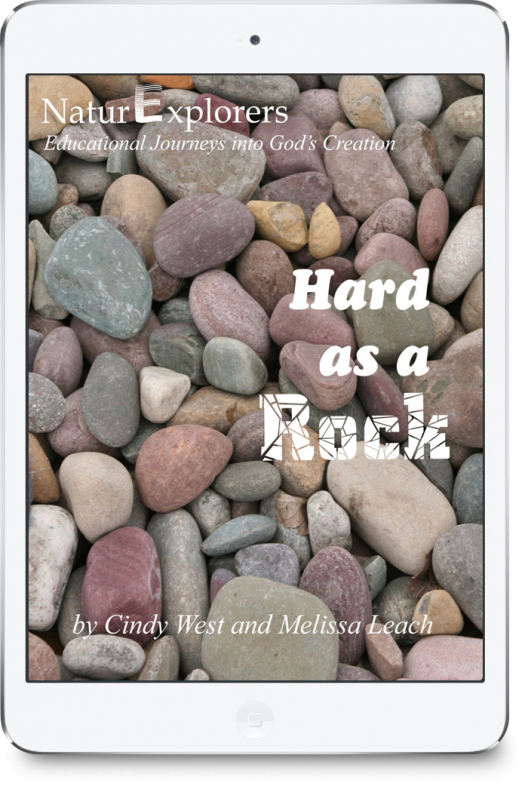 Others struggle with time, energy, health, or climate issues. Some are attempting to teach nature study in co-ops or classrooms without options to get outdoors frequently. 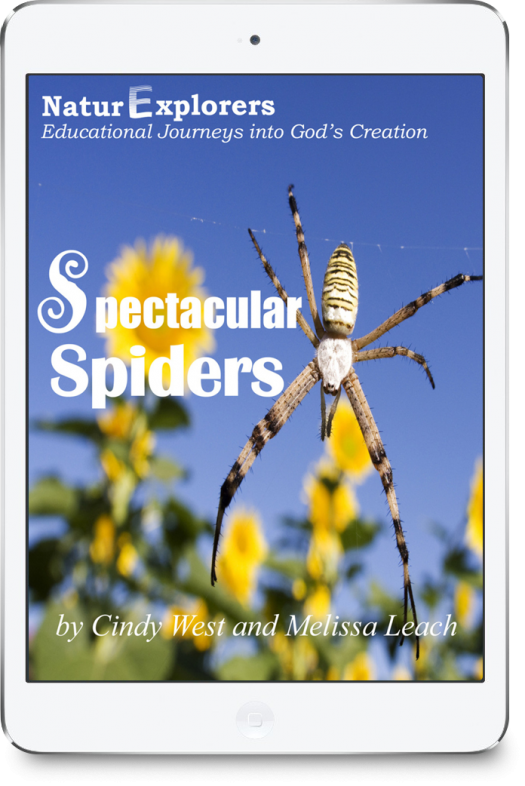 I want everyone to have the opportunity to study in-depth nature topics, and this curriculum is just about as close to real life nature walks as you can get without going outside. But, don’t stop reading just yet my “real” nature study friend. YOU can benefit from this curriculum, too! It’s a great way to add some depth and understanding to things you’re already discovering in the field during your nature walks. 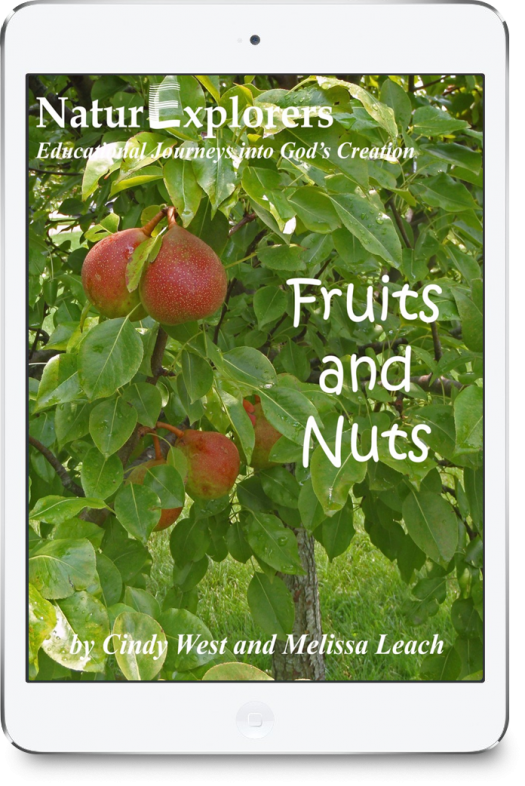 Whether your a fan of nature walks or not, you’ll find this series to provide you with a unique method to experience nature study! 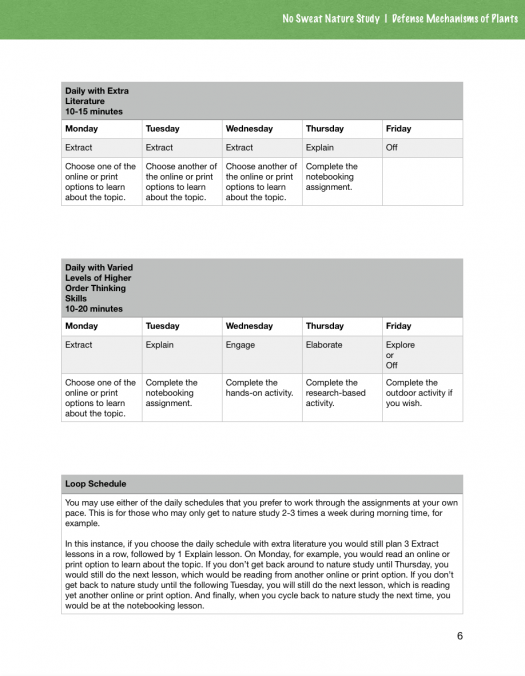 You get to choose exactly how much and what you study as you work through eight lessons. 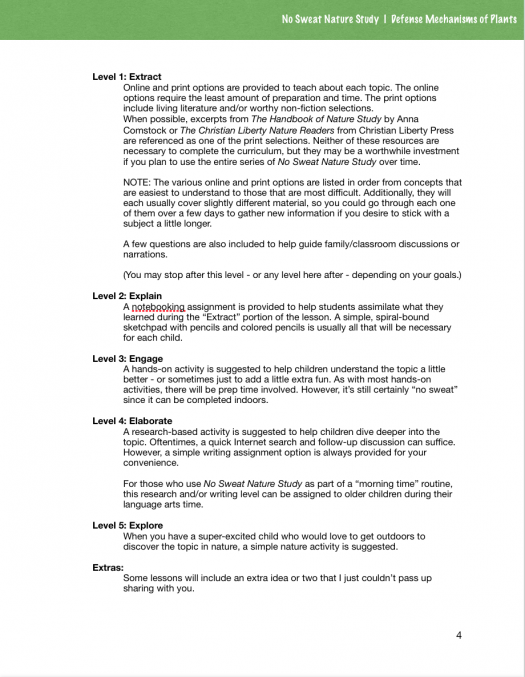 The activities are leveled for difficulty, while allowing you the opportunity to do more or less depending on the interests and abilities of your students. 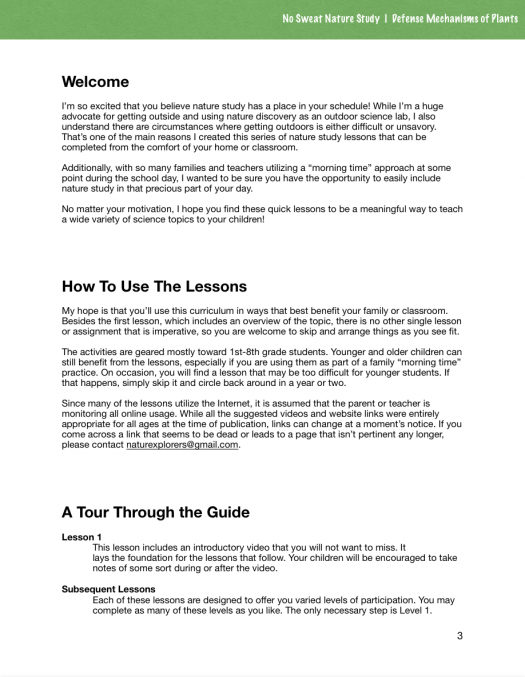 Whether you do a little or a lot from each lesson, rest assured that serious nature-based science will be learned. This curriculum is perfect to add to a morning time routine. It’s also perfect to use once-a-week as a supplement to your regular science curriculum. 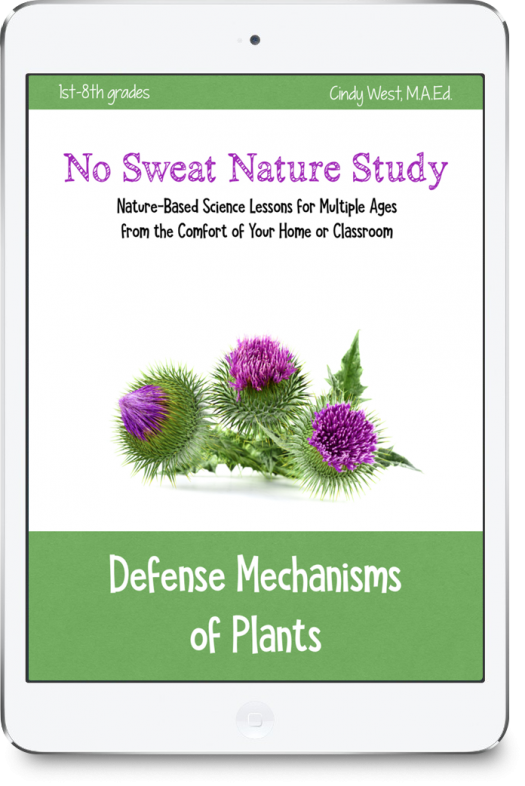 If you choose to do all the lessons and really dig deep within each, you could use No Sweat Nature Study as your complete science curriculum for whichever topics you choose. How you choose to use it is really up to you! 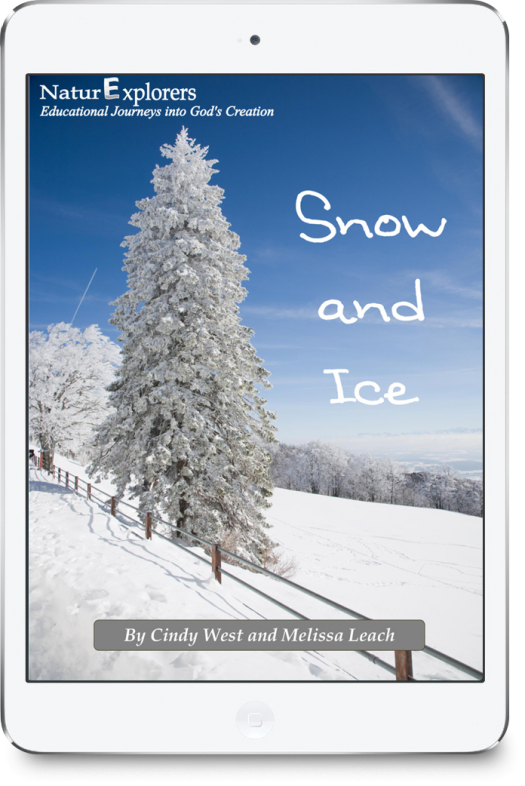 Written with 1st-8th graders in mind, the topics are really very in-depth. Using kid-size terminology and resources, I think you’ll be surprised and excited about how much scientific information your students are able to absorb! 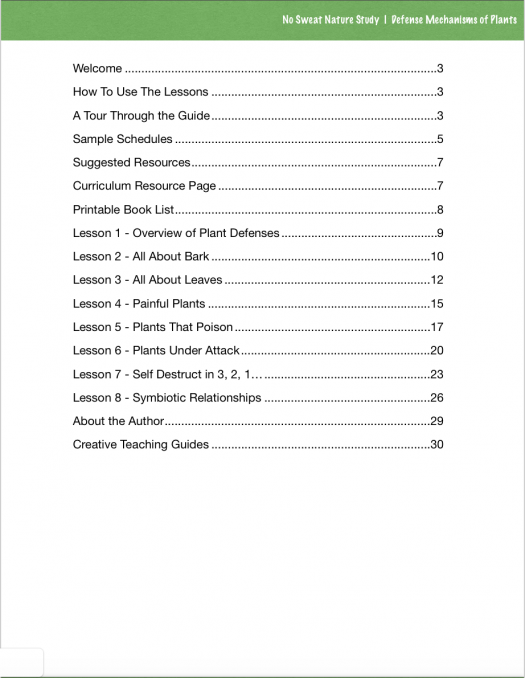 In this debut volume of the series, you will cover a vast array of mechanical and chemical defenses plants can possess. 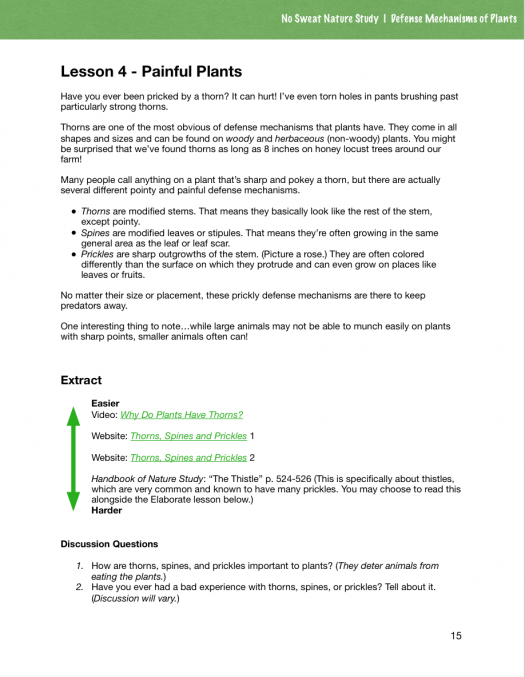 You’ll even learn about mutualism – when other plants or animals become defenses for their plant host. I know those sound like big terms! But, presented in bite-sized portions with kid-friendly explanations, they become easy to understand. 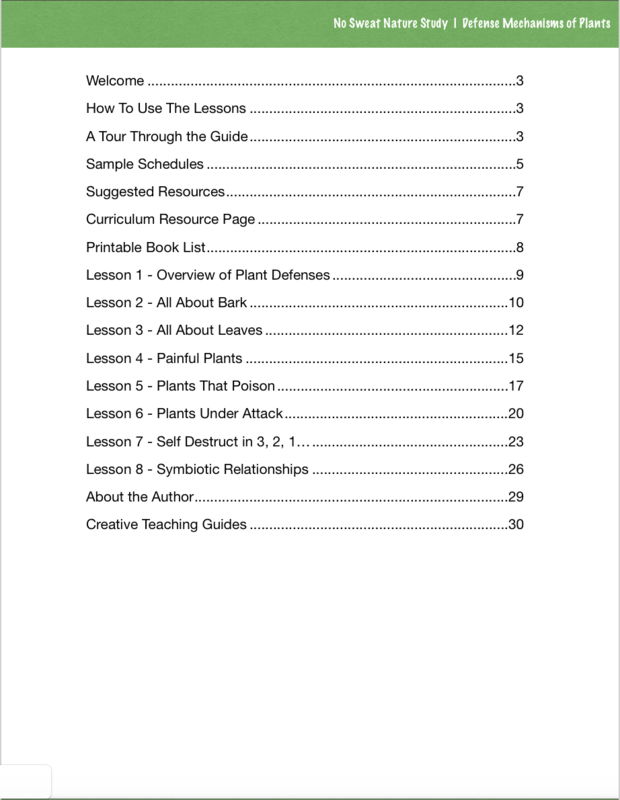 Start with these lessons and see if your students don’t begin noticing plant defense mechanisms in the real world later. It always happens – and it never gets old!